Annie joined the CBI team in July of 2016. She has a B.S. in Environmental Science with a minor in Environmental Law and Policy from Oregon State University and a graduate certificate in GIS from Penn State University. While working as an intern under environmental lawyers with the intention of becoming one herself, Annie recognized the power of data and spatial analysis in the conservation planning field and changed course to a career in geospatial sciences. She is particularly interested in the management of water resources and sustainable city planning. 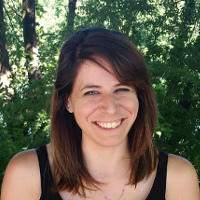 Prior to joining CBI, Annie worked as an assistant data manager for the National Park Service’s Sonoran Desert Network, developing databases and performing data analysis for the network’s birds, groundwater, springs, and streams protocols. Annie is a native of Santa Barbara, CA and currently resides in Corvallis, Oregon. She spends her free time rock climbing, hiking, baking, and traveling.